Why Dew you mistreat the National Anthem? Is the National Anthem up for grabs in a commercial? I don’t get the Pentagon Channel. I went to the Pentagon Channel’s website, but I couldn’t find video of their tribute breaks, so as to judge for myself how it looks and comes across to the viewer. What does the U.S. Code have to say about the National Anthem? 1. Designation.–The composition consisting of the words and music known as the Star-Spangled Banner is the national anthem. 2. when the flag is not displayed, all present should face toward the music and act in the same manner they would if the flag were displayed. I don’t think you can extrapolate from silence (“it doesn’t say you can’t”) and justify using the National Anthem in a commercial, even if you are The Pentagon Channel, no matter how well-intended. The American lexicon of patriotic and martial music overflows with songs, marches, and hymns to choose from without using the National Anthem. The day after I responded to the man’s question, I saw a Mountain Dew commercial on TV … the one with a tug-of-war theme and the very loud playing of the National Anthem—the Jimi Hendrix version. Mountain Dew commercials have always been edgy, but does this one cross the line? It’s clever, well-produced, and utterly egregious. I wrote to Mountain Dew, and asked for them to remove this particular commercial from their television line-up because I thought it was an gross violation of the U.S. Code regarding the National Anthem. Does Pepsi care that this commercial makes me wince? I have not received a reply, but it has only been a few days. So when is it permissible to use the National Anthem in a way other than how it is cited in the U.S. Code? Who gets to decide? What if a Hollywood big shot wants to make a movie about baseball? At some point in the movie, there could be a scene with the players and the people in the bleachers saluting the flag, and standing up to sing the Star Spangled Banner. Is that ok, because if it’s done with respect? What if the scene shows some guy in the stands belching out the tune? We decide. Make your opinion known to businesses when they cross the boundary of respect and good taste. Write, email, telephone (there’s always an 800 number), and make your opinion known at the cash register. Thank you for taking the time to email us at Pepsi about our recent advertising. We appreciate your comments and, I assure you, we attach a great deal of importance to the views of our consumers. For that reason, we sincerely regret that our recent commercial offended or upset you. That was certainly not our intention. It’s extremely important to us at Pepsi that our advertising serves to enhance the positive image that’s helped place our brands among the world’s most popular consumer products. If we should miss the mark, we need to know about it, which is why I intend to pass along your comments to our ad team. I want them to be aware of your opinion as they discuss future advertising initiatives. Thanks again for taking the time to email us and for sharing your constructive comments. From time to time at The Daily Flag, we receive questions about the U.S. Flag Code, as well as the National Anthem. Many of the questions are about etiquette. Our National Anthem, The Star-Spangled Banner, is regulated by law in TITLE 36 of the U.S. Code, and just like the U.S. Flag Code, there is no government agency charged with policing the National Anthem protocol so adherence is based on the honor system. The Star-Spangled Banner was first designated as the national anthem by congress in March, 1931, with the conduct section of the law added in June, 1942. Here is the law in its entirety. It is short and sweet, with little room for misinterpretation. I often wondered what to do when there was no U.S. flag present. It is addressed in the second part of the NA Code. Face the music and behave as if a flag is present. Now I know. The question of singing the Star-Spangled Banner is not addressed in the law, but through the years, tradition calls for everyone to join in, depending on the circumstances. Some situations may be more appropriate than others sing the the anthem. When invited to participate, by all means, sing out! The world is full of flag news today, but I have worked to bring it down to five stories for you. All but one involve kids, either in the story or in the picture. That and flags seem to be the only things that tie them together. The American Legion continues to be at the forefront in teaching proper flag protocol and flag retirement. This ceremony took place September 13th, and results from the flag collection containers the Legion placed around LaCross, WI. The American flag can be burned without prompting an outcry — but it has to be done a certain way and with respect. The American Legion can help with that. The Roy L. Vingers Post 52 demonstrated the right way to burn a flag Thursday with an official ceremony at its property at 711 S. Sixth St. This letter to the editor from a Boy Scout says it all. It doesn’t say how old Gabrien is, but I love that he is concerned with the condition of the flags flying above businesses in Indianapolis. I am writing to you because businesses are not flying the American flag properly. I go out with my parents on the Northeastside to go shopping and I have seen flags on which every corner is torn and every stripe is ripped. I am in Boy Scouts; my dad and my mom were in the military. Flag Day is once a year, but I believe Flag Day should be every day for two reasons: first, to show American spirit; second, there is a war going on in Iraq right now where men and woman are protecting our country, dying every day. We should be respectful of our country. My family and I don’t appreciate the way some people take care of their flags or their business’ flags. There’s a way you should treat a flag and this is not it. The Easy Rider paraphernalia, owned by Peter Fonda, is going on the auction block. I feel somewhat uneasy about this, but it is interesting. • The American flag taken from the back of the jacket Mr. Fonda wore throughout the film, with an estimated value of $50,000. • A Department of Defense pin that adorned the jacket, valued at $15,000. • Mr. Fonda’s gold record for the film’s soundtrack album, valued at $2,000. • His personal collection of six movie posters, including those for Easy Rider and Ulee’s Gold, Mr. Fonda’s most honored performance, with an estimated value of $500. Wilson Elementary School still teaches their students about the American flag and its importance. This living U.S. flag will be remembered for years to come by these kids. Wilson Elementary School formed the largest American flag in McAllen for a brief time Friday morning. “Put your stars up — hold on to them without moving them,” school librarian Lydia Soto instructed the students forming the flag’s star-spangled field of blue. The fewer than 500-member student body wore red, white and blue to correspond with their places in the human flag. Looking up, they waved to photographers positioned overhead in a McAllen Fire Department cherry picker and sang the national anthem. 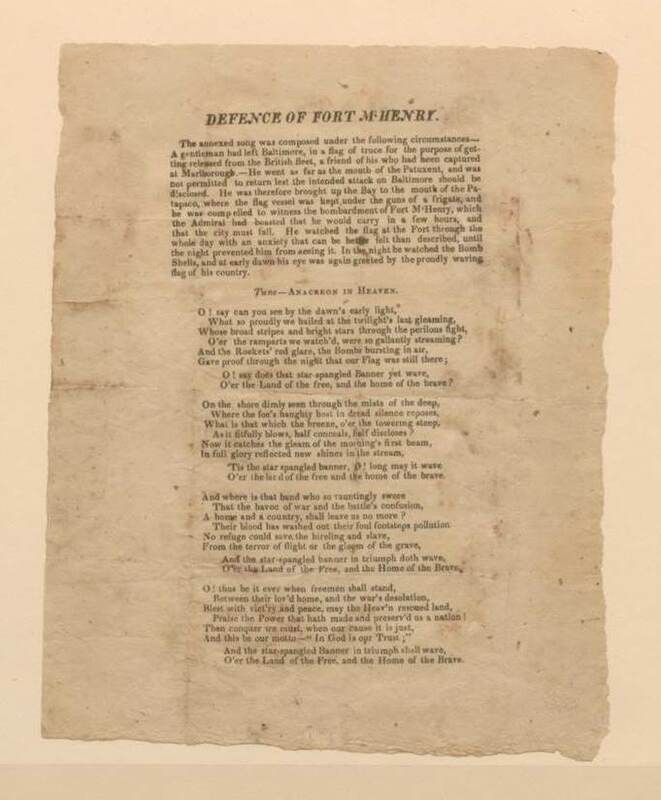 Friday was the 193rd anniversary of the penning of the National Anthem. MacArthur Elementary School decided to make a day of the celebration, ending with a picnic back at the school. Another memorable day for the student body. It normally comes before the start of special events or perhaps during a patriotic concert. But students at MacArthur Elementary School dedicated a whole day to the national anthem. Students from the Fort Leavenworth school kicked off their celebration Friday at the Lewis & Clark Center, home of the U.S. Army Command and General Staff College. They later formed an American flag in a football field across the street from their elementary school. Students participated in the National Anthem Project, a campaign sponsored by the National Association for Music Education.